Succotash is a funny word, and is primarily the mixture of lima beans and corn, with the occasional addition of peppers and tomatoes. 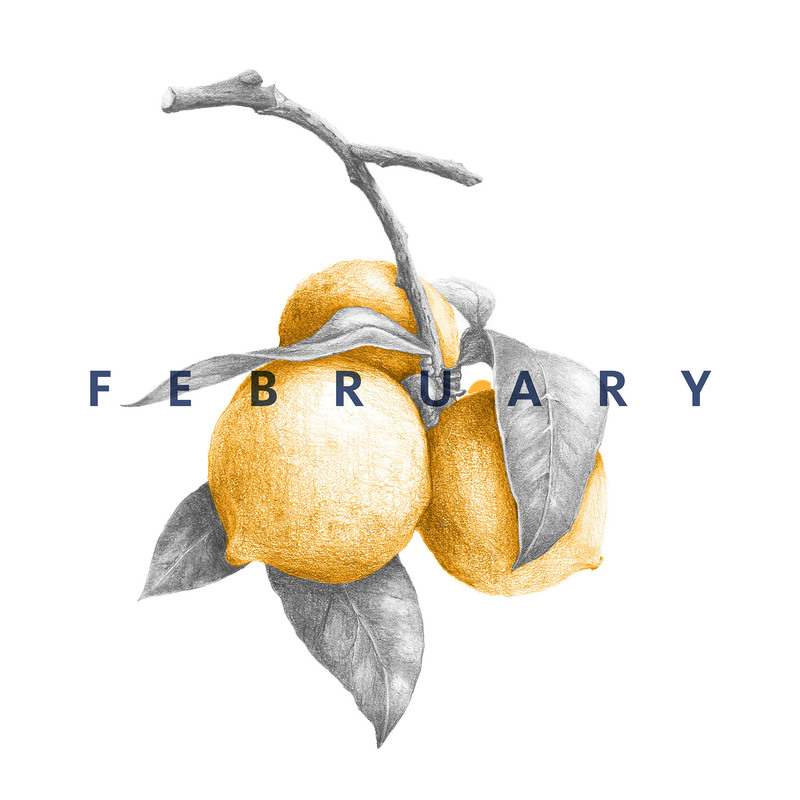 Think of it as a big bowl of summer. 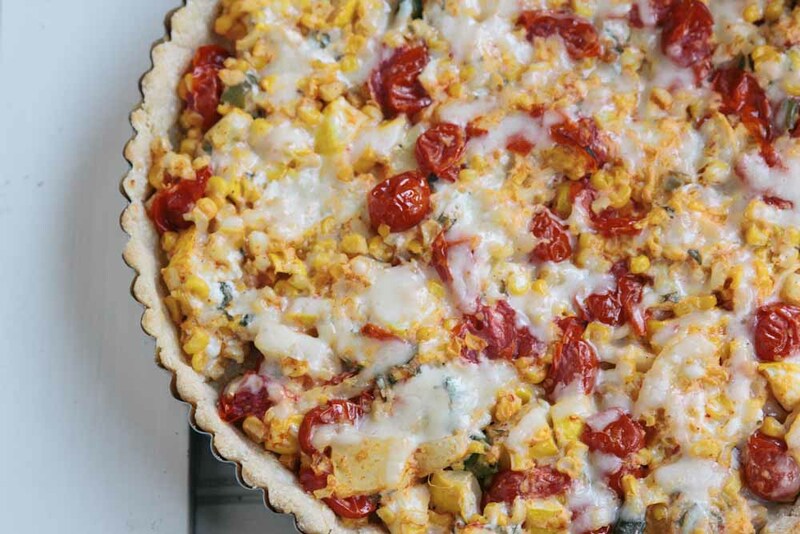 For this tart you may add in whatever veggies you pick up at the market and enjoy. This succotash cheats a little with the addition of goat and cheddar cheese but the bright, fresh veggies can still be tasted throughout. I couldn’t resist using two of my favorite local cheeses: Gold Creek White Cheddar and Rockhill Farms Goat Cheese, making for a creamy savory tart. 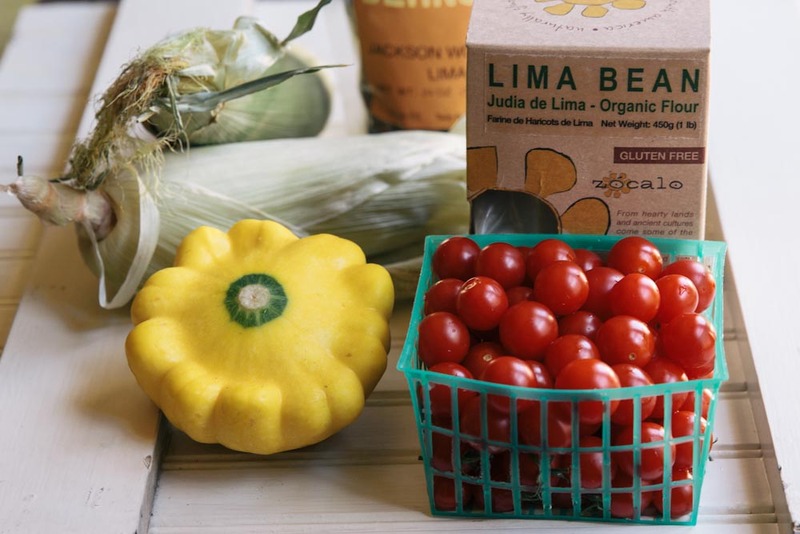 As for the crust, you can find lima bean flour at Liberty Heights Fresh, you can pick it up online at Zocalo Gourmet, or just use your favorite tart or pie dough recipe. Really this is a simple tart that can be made with lots of alterations. 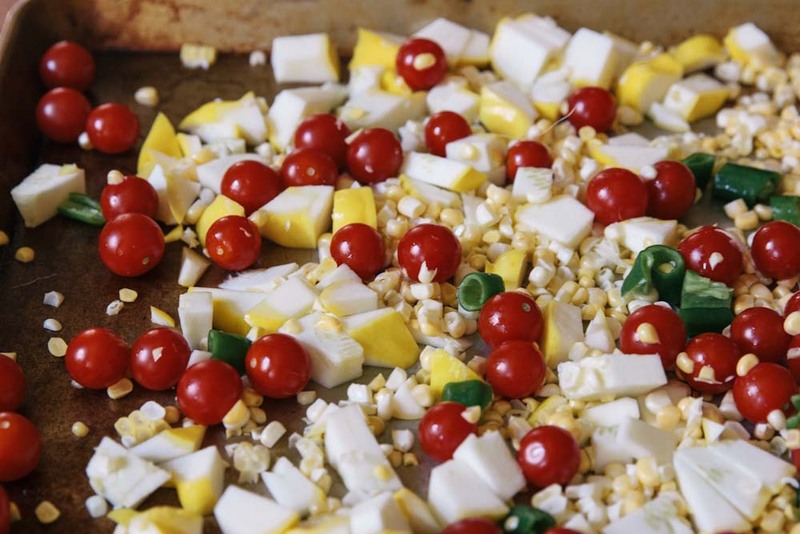 Go and get creative, make a summer veggie tart, throw in some cheese and have a ball! 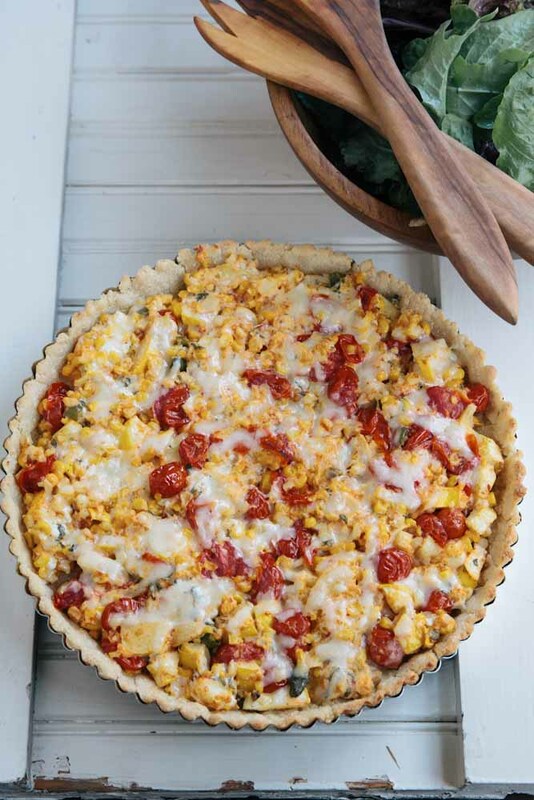 A taste of summer with fresh corn, tomatoes, squash and peppers cooked with cheese into a savory tart. 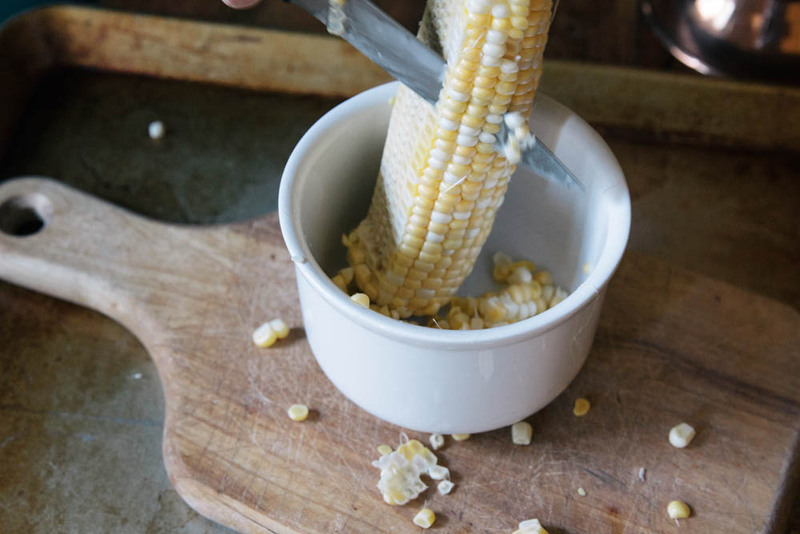 Shuck corn, chop squash and pepper. You can leave the tomatoes whole or cut in half. 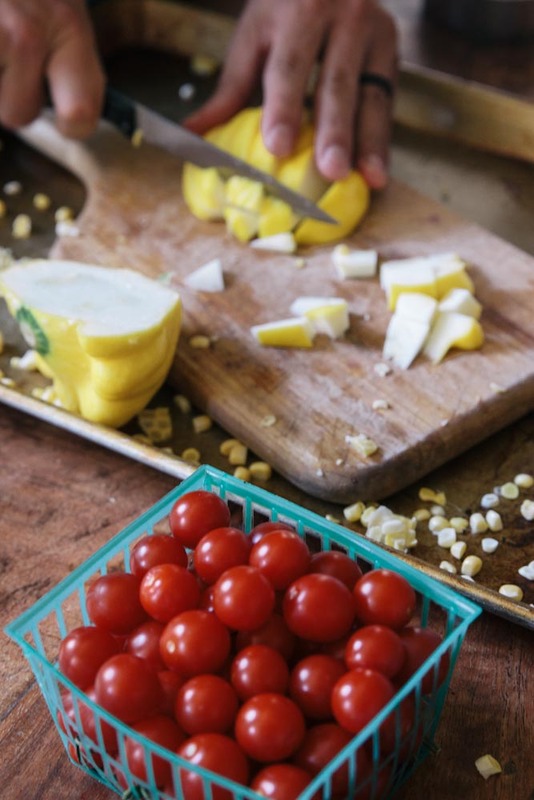 Toss the vegetables with olive oil and sprinkle with salt and pepper. Roast for 20-25 minutes at 425 degrees. Spread pie dough into the bottom of a pie pan. 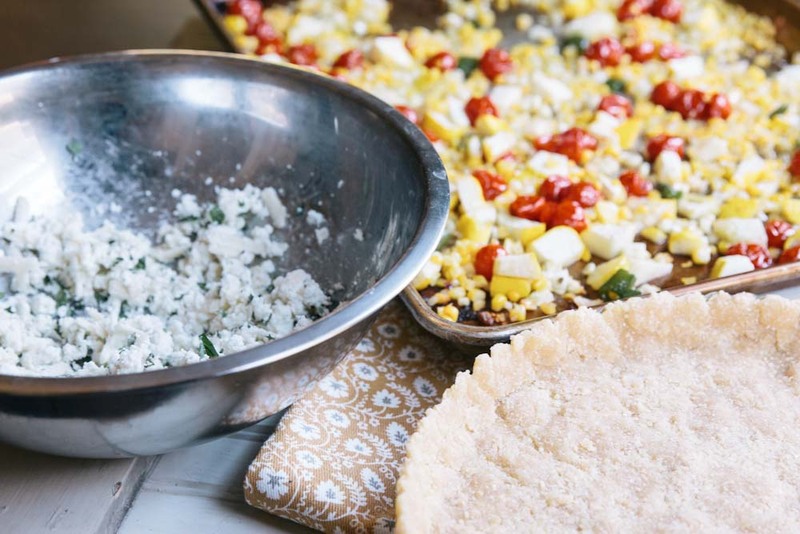 Toss the roasted vegetables with the goat cheese and half of the cheddar and spread evenly onto the pie shell. Top with remaining cheddar. Turn the oven down to 400 degrees and cook the tart for 20 minutes or until bubbly. Serve with a green salad on a late summer evening. *any vegetable can be used in this recipe and feel free to use whatever pie or tart dough recipe that you prefer. warning… this tart dough requires using your hands a getting a little dirty. Mix all the ingredients together (I used my hands because the lima bean flour is quite stiff to work with). Add water slowly, as needed, to moisten the dough, until you can get the mixture into a ball. 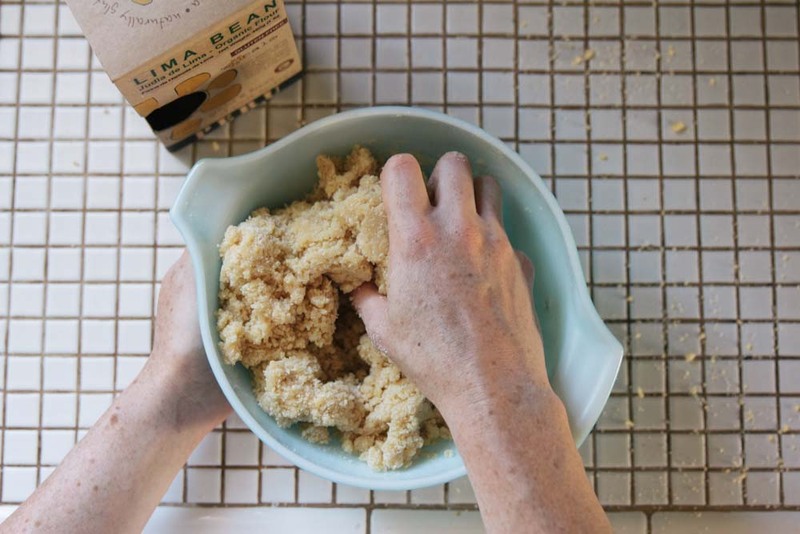 Using your hands press the dough into the tart pan (the lima bean flour crumbles easily so rolling out the dough isn't an option). Press dough to the edges and up the sides of the pan until it is evenly distributed (this may take about 5-10 minutes). Fill with ingredients above and cook at 400 degrees for 20 minutes. 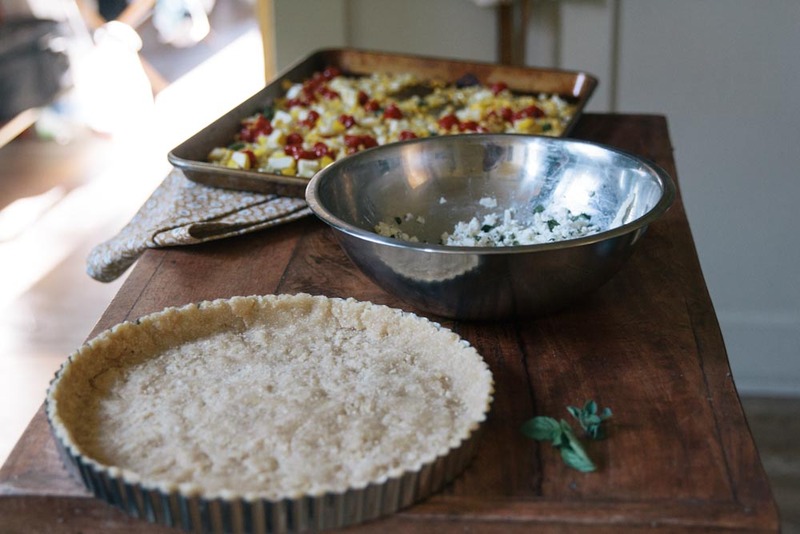 Ingredients for this tart can be found at Liberty Heights Fresh in Salt Lake City. I can’t handle how cute that patty pan squash is! The whole tart looks amazing! What a great idea and flavor combo. I bet your friends enjoyed and appreciated. That lime bean crust is so intriguing, I have to give this a try. Looks delicious! I was intrigued when I saw it too!! 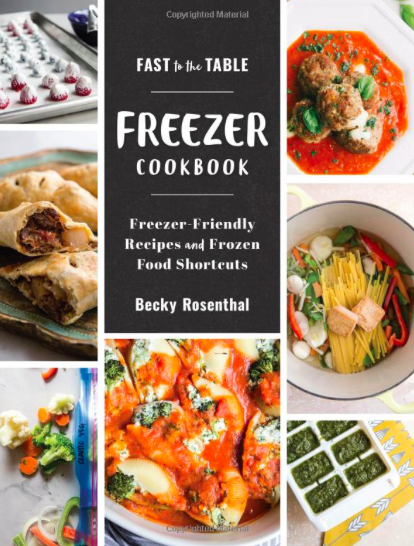 It was fun trying to think of the perfect recipe to use it in! I used used about 3/4 cup lima b. flour and 3/4 cup chikpea and 1-1/2 cup of at flour and wheat for the balance. [I am a big oat flour user. Wonderful!! Thanks for sharing your bread idea! you might be a great author.I will make certain to bookmark your blog and will come back in the foreseeable future.